Shine, gleam and revelation. 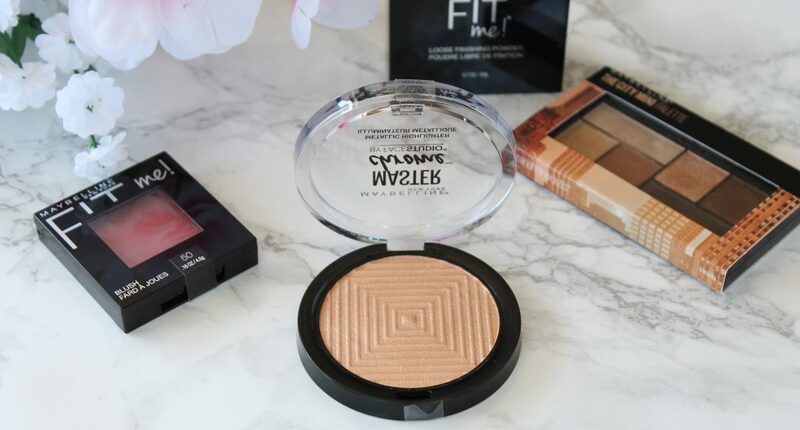 If you want to learn how to highlight your complexion in the right way, go for Maybelline. It has just launched a new cosmetic highlighter Master Chrome Metallic that will gift your face with natural shine. Let’s test this beauty product together. Thanks to Maybelline, you’ll be able to achieve very natural effect of highlighted face. You can do it thanks to Master Chrome Metallic, a cosmetic featuring a massive amount of shimmering particles. Owning to this product, your face will look rested, younger and more radiant. Surely, it will contribute to beautifying every type of makeup you want to wear. How and why should we highlight our face? Face highlighting (also known as strobing or contouring face with light) has become fairly popular recently. This makeup trick enables us to enlarge or camouflage selected face parts. Thanks to applying highlighting products, you can make your face look younger, more radiant and noticeably well-rested. This very type of makeup trick is exceptionally favoured during important events when you must look gorgeous. However, the best thing about this is the fact that you can use a highlighter instead of eyeshadows or a body balm featuring sparkling particles. Apply Master Chrome Metallic highlighter to the face covered with a foundation. Reach for a wide brush having soft bristle, or just use your fingertips. However, in my opinion, you will achieve more natural effect if you use an applicator instead of your hands. What’s important, bear in mind to use just really tiny amount of this cosmetic to highlight your face. Brush your chin, nose, cheekbones, eyelids and temples with Master Chrome Metallic. Probably you know that but let me add that you can use a highlighter to your breasts, collarbone and shoulders. Finally, if you add a highlighter to a body balm and apply it to skin, you will get an amazing effect of shimmer. Have you already mastered the art of highlighting? Like most girls, you probably want to have your look under control. In the end, every now and again you check whether the mascara is still on the eyelashes, whether the foundation did not change its colour, or whether the lipstick has already been “eaten.” However, with the new Liquid Control HD foundation from Eveline Cosmetics, you will not have to check whether everything is on point every now and then. How is this possible? Keep on reading and see for yourself. Liquid Control HD has a liquid formula and a very light consistency. It ensures a long-lasting and good coverage; only from time to time, it requires using blotting papers or a powder. Eveline foundation gives a natural effect describes by the producer as a ‘baby face effect’. Right after the application, the product is not noticeable on the face and becomes like your second skin. The cosmetic has been dermatologically tested and can be used by people with sensitive complexion. How to apply the foundation? Thanks to the pipette attached, the use of Liquid Control HD from Eveline Cosmetics is very easy. You won’t have any problems dosing the proper amount of the product you need for the whole face. What’s more, you will be able to build the level of coverage depending on your needs, occasion, etc. Feel free to use a flat brush or a sponge to create an even and flawless look. A thin layer should be enough, if not, apply another thin layer and set with a setting powder. Do not forget to shake the bottle well before the use. The foundation by Eveline Cosmetics is enclosed in a 32 ml bottle. There are six shades of brown and beige range, and you can choose from 05 Ivory, 010 Light Beige, 015 Light Vanilla, 020 Rose Beige, 030 Sand Beige and 040 Warm Beige. Although there are so few colours, I think that each of you will find the right shade. The cosmetic blends into the skin easily and provides a sensational effect. Are you ready to take control over your makeup? Have you every tried Eveline Liquid Control HD? Let me know what you think and what’s your go-to foundation! Have you ever wondered what an ideal foundation should be like? Whether it should provide high-coverage, ensure natural effect? Does it have to contain natural ingredients or will the sunscreen be enough? Will a liquid formula be ok or maybe go for a thicker consistency? 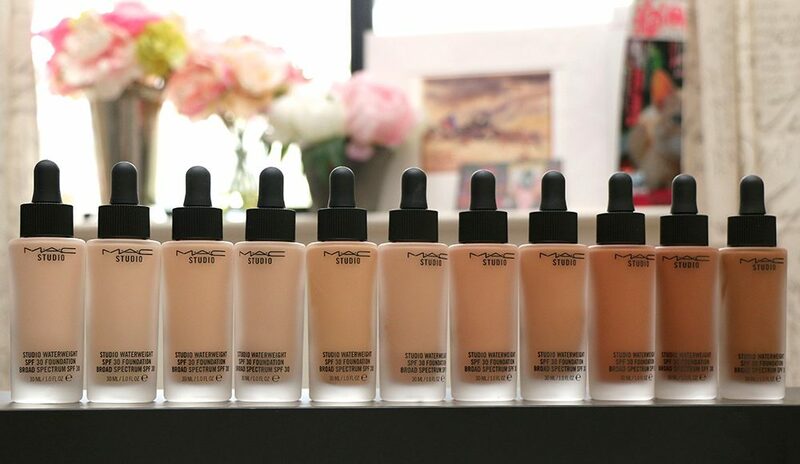 Luckily, all the questions have been answered by MAC when it has launched a new foundation Studio Waterweight SPF 30. What should you know about the Studio Waterweight SPF 30 foundation? Studio Waterweight SPF 30 by MAC is available in 22 shades in the beige and bronze range. Thanks to such a variety, everyone will be able to find their matching shade. The product gives medium coverage which means that the look will be natural without any streaks, stains and the cakey effect. What’s more, the product is long-lasting – no need for touch-ups during the day. 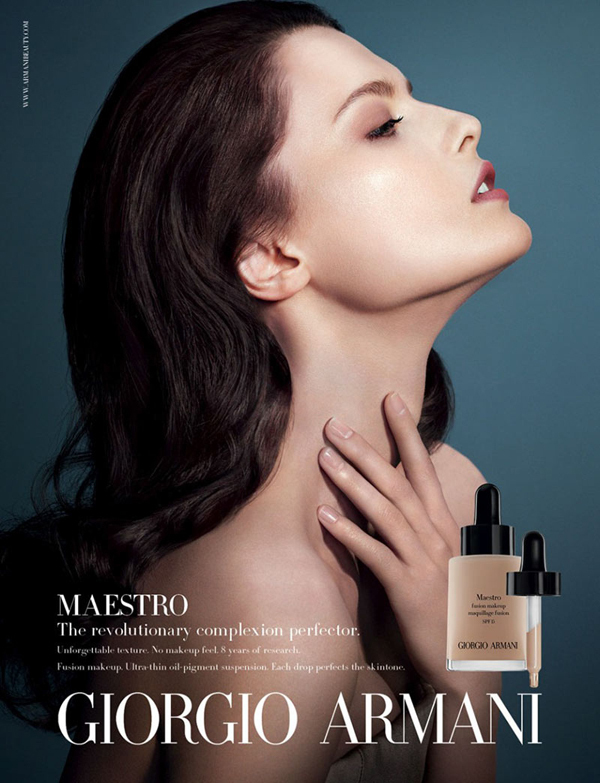 The foundation contains ingredients responsible for moisturising and smoothing out the skin. The easy application made Studio Waterweight SPF 30 my go-to product! How to apply MAC Studio Waterweight SPF 30? The foundation is equipped with a pipette that helps dose the exact amount of product you need to use. For the application, use a makeup sponge or a flat top brush. Remember to blend out the product really well, especially along the lashline, around your nose and mouth. One thin layer of the product will be enough to cover up imperfections and even out the skin tone and texture. Do not forget to set everything with a setting powder and add a bit of blush to the cheeks. Apart from the Studio Waterweight SPF 30 foundation, you can also use the makeup primer and a brightening concealer. Prep + Prime Skin foundation smooths out the skin texture, reduces sebum secretion and eliminates redness. It has the form of a liquid which is why it is so easy to apply and to distribute other cosmetics on the top of it. Furthermore, the Prep + Prime Highlighter brightens up dark under-eye circles, evens out the skin tone and conceals blemishes and imperfections. You should use a brush to apply it and distribute evenly where needed. A foundation that will not be visible on the skin? Does it really exist? Yes, and it has been created by Laura Mercier, it’s the Candleglow Soft Luminous foundation. Learn how to apply it to obtain natural makeup and look younger. Candleglow Soft Luminous foundation – who will benefit from it? The foundation by Laura Mercier is suitable for all skin types. Even people who struggle with sensitive skin can use it without worrying about any irritations. The product does not contain any comedogenic substances or talc and it has been dermatologically tested. Candleglow Soft Luminous foundation gives dewy finish and medium coverage that is buildable. 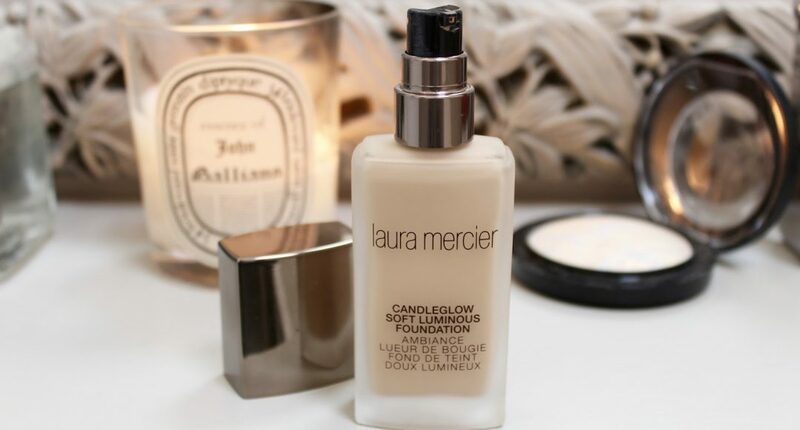 Laura Mercier Candleglow Soft Luminous foundation has a weightless consistency with brightening pigments thanks to which, the face is radiant and younger-looking. The product evens out the skin tone and conceals imperfections. As a result, fine lines and pores become less visible and the face – nice and smooth. What’s more, Candleglow Soft Luminous foundation moisturises the skin and prevents its dehydration. Due to the content of algae extract, the water level in the deeper parts of the skin is replenished. To unify the complexion’s colour, using a small amount of Candleglow Soft Luminous foundation by Laura Mercier will be enough. It is best to apply it directly over the makeup primer and use a sponge to buff it in. If you want to avoid the mask effect, blend out the product along the hairline, smudge it down the neck, at the petals of the nose and at the corners of the mouth. There are dark discolourations and scars on your face? Use a concealer first and then the foundation. This way, you’ll get a unified and natural make-up. The pump built into the packaging will certainly make the application easier. Every girl wants to have smooth and flawless complexion. Unfortunately, many of them are not as lucky and cannot enjoy the perfect skin. Luckily, there is a cosmetic that helps conceal imperfections. It is Clinique Anti-Blemish Solutions Liquid. Clinique, Anti-Blemish Solutions Liquid – who is it for? Anti-Blemish Solutions Liquid by Clinique is a foundation that is recommended for three skin types: dry combination, combination oily and oily. The cosmetic is available in eleven shades of beige and bronze range and providing a natural finish. The foundation hides blemishes, neutralizes the appearance of redness and helps prevent future breakouts. Anti-Blemish Solutions Liquid has a lightweight formula which provides moderate coverage. Therefore, if you have serious pigmentations or severe acne, then the Clinique foundation might not be suitable for you. Clinique, Anti-Blemish Solutions Liquid – what effects can you expect? Anti-Blemish Solutions Liquid has a smooth formula that will make the application and make-up removal easier. Your face will gain a natural and fresh look. Because it is intended for oily and acne-prone skin, it does not contain oily substances. It helps to mask imperfections in the form of acne, discolourations and skin redness. It contains such ingredients that help bring relief to inflammation. Clinique, Anti-Blemish Solutions Liquid – how to apply the foundation? The foundation is to be applied to a cleansed and moisturised skin. If you are struggling with acne or any other damage to the epidermis, use a makeup sponge or a flat top brush. Remember not to rub the skin too vigorously because that can increase irritations. Before the application, shake the bottle well. Apply a thin layer all over the face and blend out evenly. Next, fix everything with a setting powder; in the evening, remove the cosmetic gently and apply a generous amount of a rich moisturising cream. 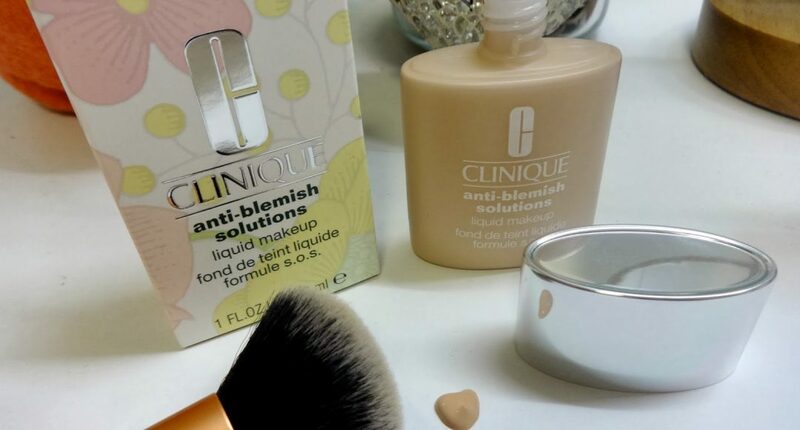 Have you ever used Clinique Anti-Blemish Solutions Liquid foundation? What’s your go-to makeup? How do you deal with such a skin type? Let me know! Which one of you doesn’t like products which are able to take care of skin and look beautiful at the same time? Of course, everyone likes such cosmetics! This very type of product is lip oil by Clarins, Instant Light Lip Comfort Oil. Let’s find out whether care can be both colourful and good-smelling! Instant Light Lip Comfort Oil by Clarins. Shades & Ingredients? -07 Honey Glam – yellow oil with shimmering particles and hazelnut content (nourish and makes lips soft). How does oil by Clarins work? The basic action of Instant Light Lip Comfort Oil is gifting lips with colour. Besides, the cosmetics launched by Clarins are to moisturise and condition lip skin. Thanks to the oils, make-up becomes complete and face looks more beautiful and younger. Natural composition of the products delivers soothing and gloss to lips. When it comes to the consistency, the oils are gel-like, which obviously facilitates application. And how to put on the oils? Instant Light Lip Comfort Oil by Clarins can be applied either as an individual cosmetic or it can be combined with a lipstick. Soft sponge-applicator distributes the cosmetic evenly providing lips with even coverage and beautiful colour. Last but not least, oils by Clarins leave lips fragranced subtly. Do you like colourful and good-smelling cosmetics, as well?